5 Minute Reading: This week we focus our attention on the current US share buyback boom and discuss the effects of sterling’s recent weakness by looking at the economic implications. We also ponder whether rampant US share buy backs and the weak pound may be linked. Staggering US corporate earnings may be stealing the headlines but there is something else creating a buzz on Wall Street, share buybacks! We wrote about this hot topic in edition 11 of True Insight, which should have landed on your doorstep by now. We understand from various reports that US companies are planning a record breaking $1trn worth of buybacks in 2018. If achieved, it will represent a 46% year on year increase. 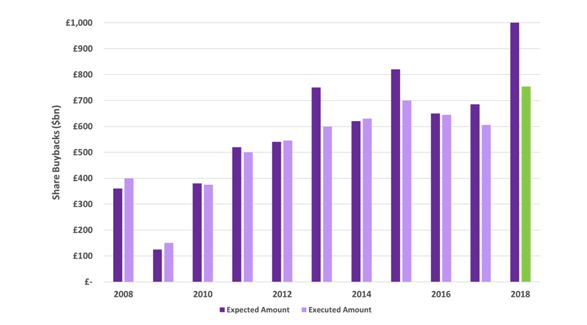 August is typically the most popular month ‘on the street’ for this type of corporate action and with executed buyback levels to date standing at $754bn, the $1trn target no longer looks far-fetched. As explained in True Insight, a share buyback occurs when a company repurchases its own shares from the open market using cash or additional borrowing. This reduces the overall share count over which profits are spread. The effect is a boost to earnings per share and it boosts other measures related to corporate profitability such as return on equity. The green bar in the chart below demonstrates that so far in 2018 the value of shares repurchased is already higher than it has been at any point in the last 10 years. 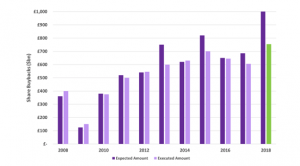 Critics worry that companies are buying back shares at already inflated prices but supporters of share buybacks say it is a sensible use of surplus cash which might otherwise be spent unwisely on sub optimal projects. As indicated in the chart, the scale of individual company share buybacks this year is staggering. It is also being fuelled by US companies bringing money back to the US that was parked overseas. Trump’s new tax plans are making this possible because the tax being applied has been reduced and according to some estimates the amount sitting outside the US is somewhere in the region of $1.2trn. At the micro level, examples of this in action can be seen with Apple who have been bolstering rising profits through iPhone sales and have large overseas cash balances. They launched an adventurous $100bn capital repurchasing programme at the start of the year helping to boost earnings by an additional 13.3%. When analysing the positive impact from share buybacks on share prices, separating cause and effect is often difficult. For example, as a company’s financial status improves their ability to finance bigger and bolder share buybacks increases. So, if the shares rise after a share buyback is this caused by improving profits or is it the effect of a reduction in the supply of available shares? By making supply scarce this can push prices up for ordinary investors to buy. However, for those investors likely to benefit, settling this argument is largely irrelevant because what matters is increasing wealth. A $1trn buyback programme is almost off the scale when it comes to our ability to comprehend a sum of money this large. However, weight of money can create a virtuous cycle, with rising market prices creating a broad ‘wealth effect’. This spills into retail investors feeling better off and spending more; ceteris paribus, enhancing aggregate demand and further fuelling the already strengthening US economic growth. The benefits of buybacks are widely recognised. Warren Buffett’s company Berkshire Hathaway recently revealed plans to loosen their shareholder distribution policy. Buffett is a key proponent of companies doing share buybacks and by showing the way with his own company he is making analysts increasingly bullish that the $1trn level is within reach and may even be surpassed. For further information on dividends and share buybacks please refer to our latest edition of True Insight – Issue 11, pg.18-21. This week, sterling fell to an 11-month low. At face value it appears to be influenced by snippets of inconclusive news from the Brexit negotiations. For the first time in almost a year it dropped below $1.29 following renewed concerns that the UK may leave the European Union without a trade deal. 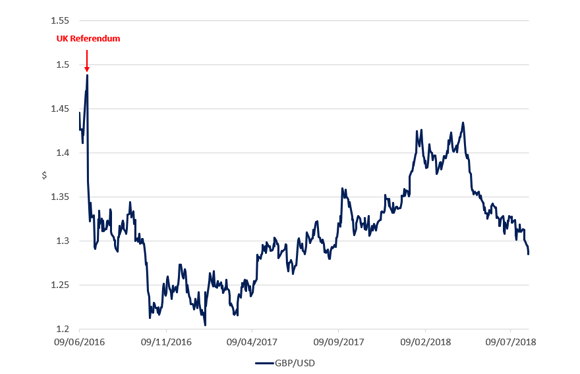 From the chart below, we see that in the immediate aftermath of the June 2016 referendum the pound fell sharply, reaching a low of $1.20 against the US dollar in January 2017. Sentiment around Brexit negotiations subsequently improved and UK economic data confounded the pessimists leading sterling almost to make a full recovery before turning negative again 16 months later. Why is sterling fluctuating so much? • Overreaction following Brexit – it is understandable for investors to be emotionally sensitive to unexpected events. The sharp decline highlighted investors’ concern. However, as fears receded, sterling recovered. Speculation of a potential no-deal between the UK and EU (rather than fact) has reignited those fears. • Economic Data – an improved labour market, where unemployment touched its lowest level since 1975 (4.2%), cushioned sterling’s recent weakness. • US Dollar – US economic growth, as measured by GDP%, jumped from 2.2% in Q1 to 4.1% in Q2, supporting the case for higher US interest rates. This has propped up the Dollar making it harder for sterling to gain traction. What are the implications of a weaker pound? We know when crossing the Atlantic to the US or travelling to Europe on holiday a weaker pound doesn’t give us the same spending power. This applies in reverse when UK companies are exporting. In other words, overseas buyers can buy our goods more cheaply. For the UK a weaker currency makes exports more affordable to overseas buyers. Growth in exports contributes positively to the overall level of UK economic growth. 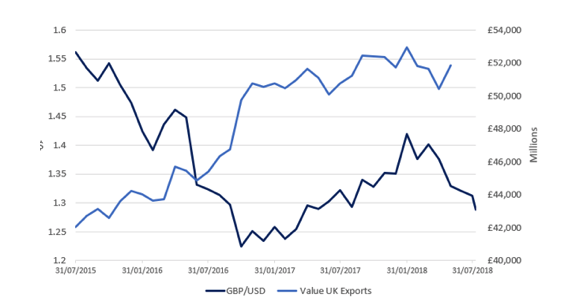 The chart below shows how sterling and exports are negatively correlated – as sterling goes down, exports go up. For UK businesses with international revenue streams, a weaker domestic currency provides a windfall effect. When translating overseas revenues, businesses earn more revenue if sterling depreciates. However, this can operate in reverse with less revenue earned if sterling strengthens. The impact on corporate profits can be significant which impacts many of the top UK 100 companies. For example, drinks maker Diageo, which has substantial dollar revenues reported healthy profit growth for Q2 this year. However, they warned that growth had been pared back by currency headwinds. Since the UK referendum result in June 2016, M&A activity has boomed to nearly 11,000 deals in the two years ending June 2018, equating to £1.7trn in value. The weaker pound has also made UK assets cheaper. This is allowing large international businesses with deep pockets and ready access to cheap finance to use debt to capitalise on the discounted prices of UK assets. It is argued that currency movements tend to smooth out over the long run, with economic fundamentals dictating the direction of travel. Foreign exchange markets are large and run deep. Daily volumes run into trillions of pounds and they are open 24 hours a day. 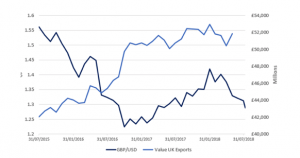 Short-term factors however also influence currencies, sometimes meaningfully.Therefore, it is not unreasonable to assume that heightened levels of uncertainty surrounding Brexit is the main culprit. Notwithstanding this aspect, the pound also gets caught up in the cross fire between the major currencies i.e. Euro and the Dollar. With the US economy displaying surprising strength, and US companies repatriating cash previously parked overseas to help buy their own shares, the dollar is getting a lot of support right now. It may be a stretch of one’s imagination to suggest US companies buying their own shares is causing the pound to weaken against the dollar, but we contend it forms part of the currency story. At some point the windfall effect for the dollar will come to an end.